For children ages 5 and up. 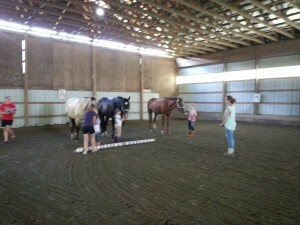 Children will be kept very busy with horseback riding, games on horseback, crafts, barn chores, caring for the horses, fun barn games, lessons on horse anatomy, breeds, tack and more! During the warmer days, children will get to bathe the horses, learn the proper way to clean the tack and have some water fun of their own! All while making friends at ELPH! Print form here ELPH Camp Form . Please bring your forms in with you on the first day of camp.